Due to my recent minor involvement with a local brewpub (Moon Under Water) I was able to attend this year's Craft Brewer's Conference. If you don't know about this conference, the Craft Brewers Conference is for professionals in the brewing industry (you have to be a Brewer's Association member so breweries in planning can attend but general homebrewers can't). The conference was in Portland, which was an excellent location for such a thing, and was about a month ago. It was a great experience and I'm very glad to have gone. The biggest thing I can say about the presentations in general is get in early. Many of the talks, especially those on hotter topics like sour/mixed-fermentation beer tend to fill up. And many people that are interested in the talk end up not being let in. There is time between talks to get to the ones you want to early enough, but it is even better if you can stay in the same room and/or duck out of a previous talk a bit early if it is less informative for you to ensure that you get into the talks you really care about. When the doors opened for the Mixed Fermentation panel there was a steady stream of people entering and it filled really quickly, so if you wanted to show up a couple minutes before it started and still get in you were out of luck. I'll focus here on two talks - Kara Taylor's Titratable Acidity talk and the Mixed Fermentation panel led by Garrett Crowell of Jester King and including brewers from Sante Adairius, Crooked Stave and New Belgium. Both of these got me thinking and I was especially inspired by the mixed fermentation panel. But there were definitely other excellent talks. Some of the other presentations that stood out for me were a dry hopping talk from Dr. Tom Shellhammer's group at Oregon State. They are at the leading edge of hop research in North America and their talk had some cool information in it. I was most surprised to learn that in some cases oxidized alpha acids may account for the largest portion of bitterness in a beer (between isomerized alpha acids, oxidized alpha acids, and oxidized beta acids). I had heard that oxidized beta acids may have a significant contribution to bitterness, especially when using aged hops in beers following the traditional process of lambic, but had not heard about oxidized alpha acids before. Both oxidized beta and oxidized alpha acids are soluble in beer. And because isomerization does not occur with oxidized alpha acids, they can directly add bitterness without being boiled. The other presentation I'll mention briefly before jumping into more detail on others was the kettle souring presentation by Ben from Breakside, Ben Love from Gigantic and Sean Burke from Commons. The three brewers described their process and reinforced that they don't believe that kettle souring is a very good technique to make a fully sour beer, and that it should instead be used to add a bit of tartness to an otherwise clean beer. I think that this can't be said enough. I see a lot of breweries and homebrewers getting into quick sours and in my experience these beers are under-attenuated and one dimensional. However, I think it is a great way to add tartness to a beer that is fermented cleanly or to drop the pH a bit before using brett and/or bacteria as I outline in this post. With this said, not all the brewers seemed to follow their own advice as one of the three example beers served was prominantly and one dimensionally sour. Kara Taylor from White Labs gave a pretty interesting talk about Titratable Acidity. This is something winemakers think about but brewers don't think about it so much. And for the average (or even advanced) homebrewer it may not be especially applicable in everyday brewing. But it may have some really powerful potential when it comes to blending multiple barrels of aged sour beer, especially in a larger commercial setting where testing out the possible combinations becomes a bit more daunting. measuring the amount of the acid that has separated, titratable acidity measures the total acid concentration. For a brief chem overview, you can think of an acid as HA, where the H+ is a hydrogen and the A- is something that this hydrogen is bound to in an exchangeable way. pH measures the H+ part, so the stronger the acid (the more the H+ separates from the A-) and the more of a given acid present, the more free H+ there will be and the lower the pH. Here is a simple diagram similar to one Kara showed where the yellow dots represent the H+ part and the blue dots represent the A- part. 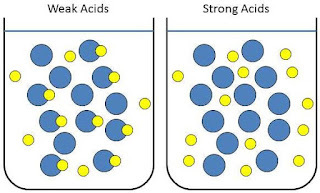 Titratable acidity measures the amount of acid, independent of strength, by measuring all of the yellow dots whether they attached to an A- or free. 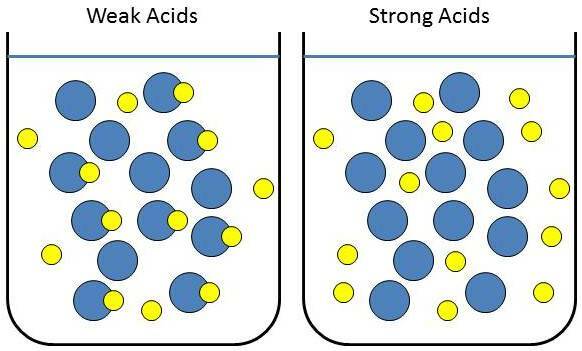 Neither technique is able to fully distinguish one type of acid from others, but equal concentrations of acids of different strengths will have different pH values while having the same titratable acidity. All that is fine, but what we really care about here is how the beer tastes. In her talk Kara presented that titratable acidity has a better correlation with perceived acidity than pH. In this way, for brewers to target a certain perceived acidity in their beers, titratable acidity might be a better measure than pH. What was even more cool is the possibility of targeting a given perceived acidity from titratable acidity and residual gravity. A higher final gravity or more sweetness in a beer correlated with lower perceived acidity than the titratable acidity would suggest. And with the preliminary data Kara presented, there was potential for a linear relationship between the perceived acidity and the ratio of final gravity divided by the titratable acidity (Plato/TA). A lower Plato/TA value would mean either lower final gravity or higher titratable acidity (or both), and low P/TA beers showed higher perceived acidity. The data set Kara had was very preliminary and was mostly based off of a cluster of low P/TA point and one lone higher P/TA point, so it is hard to tell if there is really a linear relationship. But the idea is pretty cool. And if it is correct then it can be a very powerful asset when blending. Unlike pH, both titratable acidity and residual gravity will mix linearly. If you mix equal volumes of a 1 plato beer with a TA of 20 with a 2 Plato beer with a TA of 10, you end up with a 1.5 P beer with a TA of 15. In some cases pH may mix logarithmically, but things like different abilities to buffer acidity and the strengths of weak acids will also influence pH, so it may not necessarily mix logarithmically either. For targeting a given perceived acidity in a final product, a brewer blending many barrels can calculate the final gravity (at least before any potential refermentation) and titratable acidity of the blend given the components, and then choose to omit certain barrels or include a desired amount of an acid beer to hit a given P/TA ratio in the final blend. So again, for the homebrewer this may not be as useful as you can more easily taste the combinations you are thinking about, however knowing the titratable acidity and gravity of the beers you have for blending can help give you a starting point for thinking about which beers to try blending together for taste samples. And especially as a larger commercial brewer introducing TA measurements could be really useful tool for blending. The other presentation I'll focus on here, and the biggest highlight for me in the presentation realm, was a panel discussing Mixed Fermentation led by Garrett Crowell from Jester King and including Chad Yakobson (Crooked Stave), Jason Hansen (Sante Adairius) and Peter Bouckaert (New Belgium, formerly Rodenbach). In this panel, each of the brewers gave a quick rundown of their experience and process and how they adapted what they were doing to use their cultures to produce better results. For the 3 younger brewers/newer breweries, this was mainly about how they formed their house cultures and how they use these cultures in the breweries. All of these brewers were using mixed cultures that can't be reproduced with microbes bought from a yeast supplier. They were mixed cultures maintained in house, with influence from some combination of wild microbes from the environment around the brewery, bottle dregs, commercial cultures, natural drift and brewer manipulation/guiding of that drift. To balance this discussion out, Peter focused on his work with Rodenbach to use lacto in stainless tanks and how they had to adapt their process and let their culture change a bit in order to get the results they wanted. Some of the brewers also talked a bit about what mixed culture fermentation meant to them. I found this part inspirational and I was really excited to see this mentality to balance out the fast sour methods that seem really popular in North American craft beer today. Not that fast sour beers are inherently bad. I see them as different from mixed fermentation beers and I am not as excited about them because I think many people producing fast sours don't see a difference between these beers and more developed sour beers. When I go for an acidic beer, I almost always do so because I was a complex, well attenuated and drinkable beer. And in my experience fast souring tends to not create this. The beers are frequently unbalanced, not well attenuated, and one dimensional. So while that can produce a fine beer, it doesn't generally produce the developed and complex beers that I am looking for. I think Garrett said it well when he differentiated quick sour beer from mixed culture fermentation "We could make a sour beer very quickly at low temperature, but that kind of deviates from the ambition of mixed culture fermentation in which you have many components that you are trying to represent." The overarching theme to me in this presentation was that the production of world class mixed fermentation beers takes a different mindset than what brewers are used to for beer production. There is no single set of rules/process/recipes/etc. tat will produce excellent mixed fermentation beer, and this is very different from a lot of other brewing. I've described it a couple times already by comparing mixed fermentation to pilsner. For a pilsner, there is a well established general process and recipe, and following those well and knowing what you are doing will yield a good pilsner. That is not to say that it's easy. Given the number of not excellent pilsners out there it definitely isn't that easy. But with mixed fermentation beer there is no set of steps to follow for success. The brewer must learn his or her culture, his or her process, and how the two relate to each other. And adaptations must be made to guide the culture toward producing the results you want. These brewers came from diverse backgrounds ranging from advanced degrees in brewing to never having worked at a professional brewery before this, and whether the brewer took a more scientific/technical or a more artistic approach to the beers they were making, they had this mindset and followed no technical set of rules. They had an understanding of their culture and how it behaved based on their process. They knew how to increase or decrease acidity, they knew when the beer needed more time, how to maintain their culture and work with or control the natural drift, etc. They knew this from experience with their cultures and careful observation, and they were constantly learning more about how to work with their cultures. That's not to say there wasn't any information to take out of the talk. All four of the brewers talked about exerting some control over the balance of microbes and the acidity by factors such as IBUs, gravity, temperature oxygenation, and pressure from larger vessels that can be applied by other brewers. The first one is pretty straightforward - elevated IBUs inhibit bacteria. OG influences production by higher OG (and therefore higher ABV) inhibiting bacteria more than yeast. Depending on the strains you have, temperature can be a bit more complicated. The classical understanding is that elevated temperatures promote lactic acid bacteria. However Garrett at Jester King mentioned that when they ferment cooler, they get faster acid production. This seems counter-intuitive at first, but it makes sense if you consider that they are using multiple saison oriented strains in their culture that like to be at elevated temperatures. And working at lower temperatures may cause those sacch strains to be less active and may leave more for the bacteria. Oxygenation is also a bit more straightforward, with more O2 promoting yeast growth and depending on the specific bacterial strains, maybe inhibiting bacteria. Conversely low oxygenation inhibits yeast growth and leaves more for the bacteria. While both yeast and bacteria don't like increased hydrostatic pressure, Peter mentioned that high pressure seemed to inhibit lacto more than yeast. So there was plenty of technical info in the talk, just no clear set of rules/process/ingredients to follow to get world class mixed fermentation beer. A lot of these aren't necessarily revolutionary (though that Jester King temp experience is contradictory to the classic idea of how the system works) but they show the relatively simple and well grounded thinking that these brewers begin with to manipulate the cultures and process to end up with beers they like. And they show the ability to accept that results may be opposite of norm given their specific set of circumstances. One exhibitor stood out to me as being rather relevant to home brewers in the products they sell as well. This was King Orchards, a company in Michigan producing tart cherry (Both Montmorency and Balaton), pear and apple concentrate. These concentrates are 68-70 brix and are are pure fruit (no other ingredients). Commercial brewers have had access to products like this before with Oregon Fruit (though I'm always happy to see another option on the market). But I think King Orchards is an especially good option for homebrewers as they sell 1 oz packs (the main target audience here seems to be people wanting a single glasses of juice) as well as pints and quarts of concentrate. These small sizes seems perfect for homebrewers playing around with adding cherry to 1 gallon jugs up to normal batch sizes. It might take a bit of work to get the ratios right, but it should be too hard. There might be other comparable products (pure non-frozen juice concentrates) available to you locally, but if not these guys might be worth checking out if you want to try out a small amount of sour cherry in a beer. Alright, just a bit to close this out on the conference in general. It was a great time. The conference is full of people with an unbelievable amount of knowledge in brewing equipment/process/ingredients/etc. And many of them are there to share that knowledge and pick up what they can from others. I was generally surprised by how friendly and open people were. Especially people like Vinnie (even though he is notoriously open and friendly) who probably get strangers coming up to them dozens to times a day. Sure, there were a bunch of pretty strange questions at talks and some not so informative talks (the biggest disappointment to me was a talk about transitioning from home brewing to pro brewing given by someone who had never homebrewed), but with an open mind and a reasonable amount of desire to look into the odd thing here and there rather than taking everything as pure truth/the best way, there is a lot to be learned.